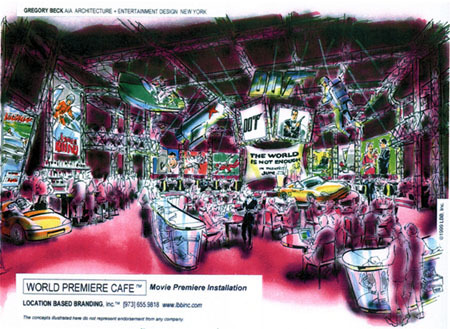 The World Premiere Cafe is a unique, immersive experience that reinforces the relationship with the consumer and enhances brand positioning. Re-theme the interior designs for the sponsor product. Rename menu items for the sponsor and create several key menu items based on the brand needs. Re-theme all staff wardrobe based on brand identity. Run promotional programs in conjunction with sponsors. 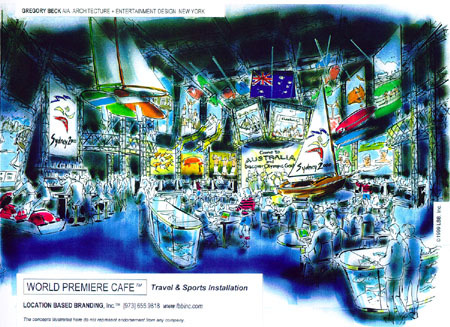 Is a 350 seat, full service restaurant with a 45 seat lounge with a stage for performances/demonstrations. Uses interactive, virtual reality to create guest experience. Uses table-mounted touch screens video monitors allows for playing CD-ROM games and internet access. Uses high definition projection screens for ease in changing theming. Uses modular wall displays for mounting large-format digital images. Has a full range of theatrical lighting with programmable effects. Uses a structural grid for hanging large props. 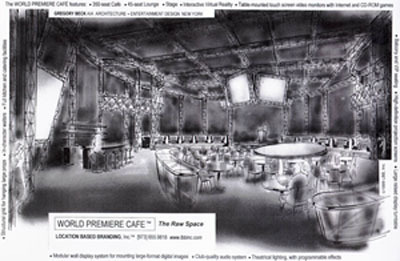 Would use live theatrical performances and actors where appropriate for further guest/brand interaction. Click here if you would like to look at some of the very early Experiential Advertising work that Location Based Branding founder David Polinchock did with the CyberEvent Group did in the early 90's.